I think my 17-day old starter is ready for prime time. 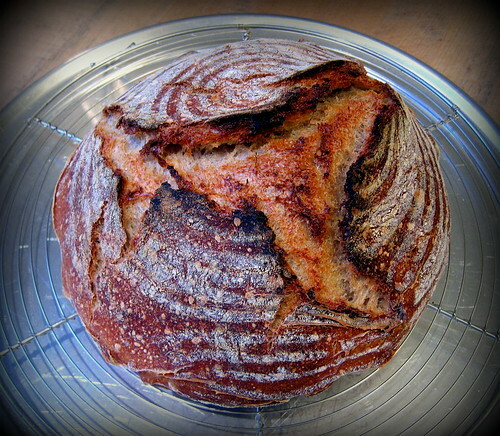 I baked this San Francisco Country Sourdough using Glenn's formula. Everything was done at room temperature (approximately 73F). No retarding. Autolysed for 45 minutes, then I pinched in the salt and 50 g reserved water. Bulk fermented for 4 hours (S&F every 30 minutes for the first 3 hours and then untouched for 1 hour). Preshaped and bench rested for 30 minutes. Proofed seam side down in brotform for 2.5 hours. 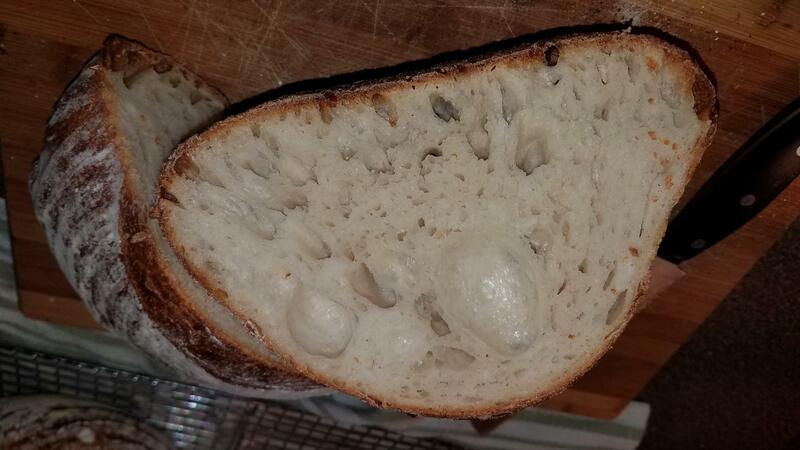 Baked with seam side up (no scoring) in a preheated cast iron combo cooker. 450F for 20 minutes with the lid on and 25 minutes with the lid off. 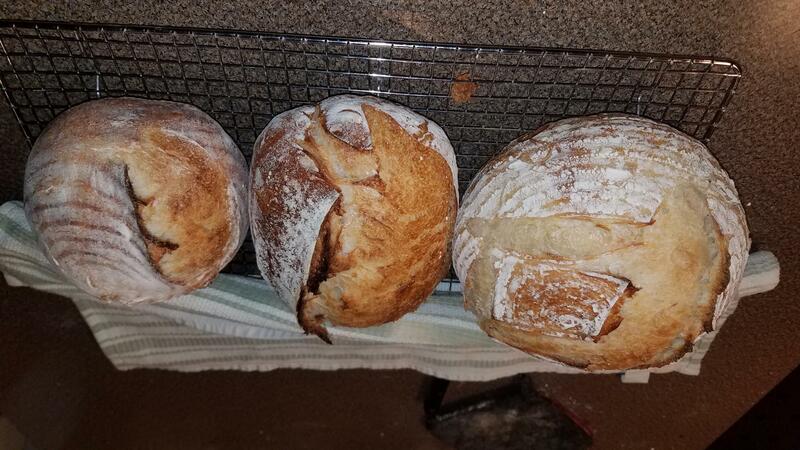 It's the best naturally leavened bread I have baked to date. Well, that's not really saying much since this is only my 4th time baking bread using a starter. But I think it's a good start! Well done, looks beautiful! Nice photos. cranbo - I got a bit carried away with "instagramming" the photos, but thank you for the compliments. I need to stop looking at this site when I am hungry! 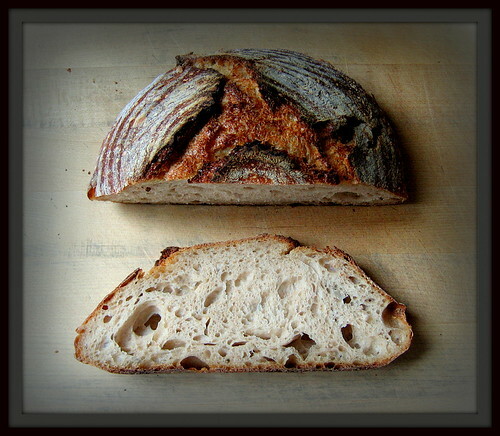 Beautiful colour, crust & crumb. Congratulations. Darwin - I feel the same way. Beautiful! Would you mind if I feature this for a bit? Floydm - I would be honored! you have the touch ! I'll let Glenn know where to look for pointers! 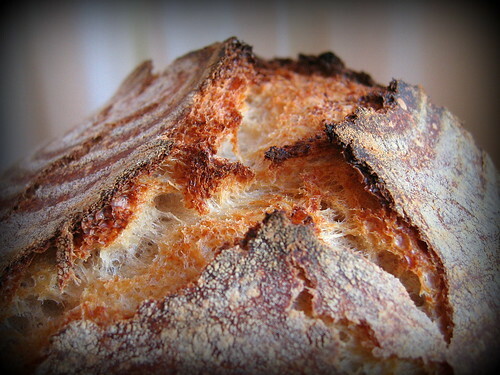 That looks fantastic - crust and crumb! I'm glad others are using my SF Country Sourdough formula (it's really a variation on a variation on Hamelman's Vermont Sourdough). It looks delicious! That is a beauty. I think "a good start" is an understatement! Nicely done. Way better than my 4th levain bread, so good job! That is beautiful! Well done! Enjoy! Masterpiece! Haven't seen a loaf so picturesque in a while. but so happy to see your beautiful loaf! Gorgeous reddish caramel crust, beautiful blooming seams, it's really a looker! Congratulations on a loaf well baked. You Let it rip wild and free, dont need to score it. Looks amazing! I am sure it tastes as good as it looks, well done! 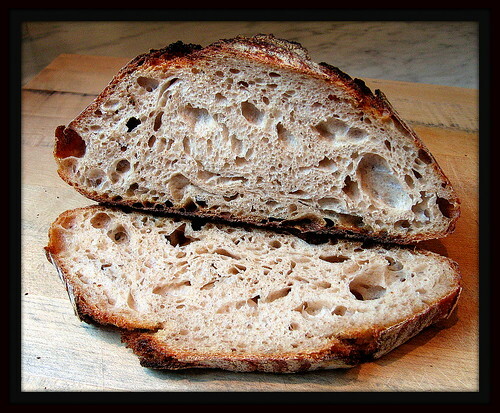 Crust and crumb look fabulous. Excellent job! wow i am getting hungry just looking at these photos!